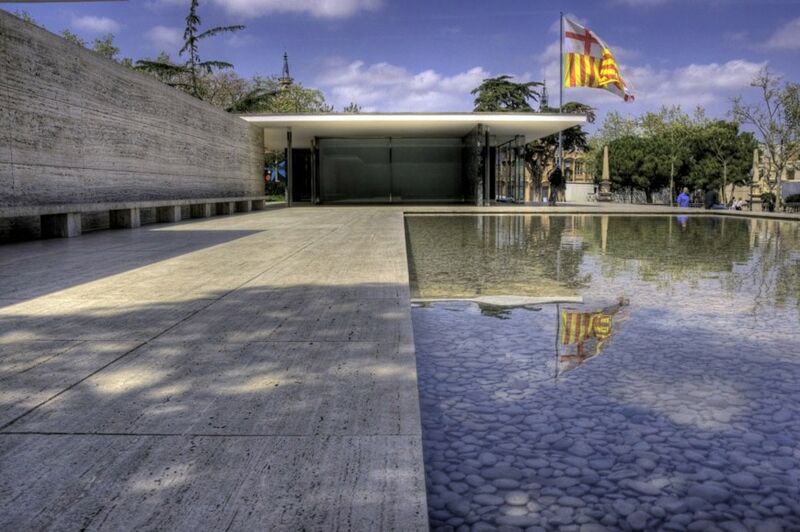 The German Pavilion, also known as Barcelona Pavilion, is a small building at the bottom of the Montjuic hill, designed by Ludwig Mies van der Rohe for the 1929 Barcelona Expo. The German government commissioned Ludwig Mies van der Rohe and Lilly Reich to design of the pavilion as Germany’s contribution to the 1929 Barcelona International Exposition. The pavilion was not intended as an exhibition hall but as a representative space and, in a sense, as an exhibit itself. The idea was to show the world the new architecture, the democracy and the spirit of peace which Germany was able to attain after the end of the Great War and which would be wrecked by Hitler just three years after the Expo. 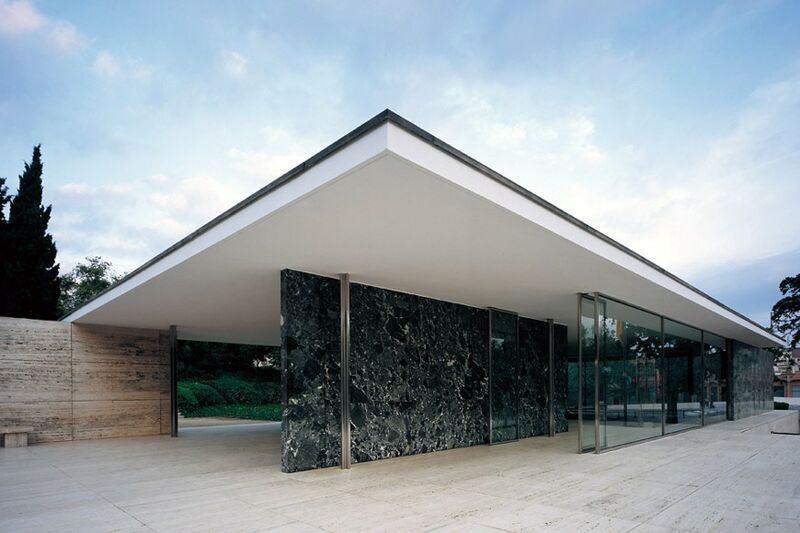 The building complex designed by Mies includes a main open-plan pavilion, whose rectangular footprint is based on a 1.09-meter square module, in which all spaces flow one into another as if it were a single hall. This main volume is connected by a passage, flanked by a long stone bench, to a second, smaller, building, made of plastered masonry, which contains two offices and two bathrooms. The whole complex stands on a 1.3-meter-high podium, clad in Roman Travertine, which “raises” the building above the ground and creates an elevated terrace, an element which we can see in other projects by the German architect, such as the Neue Nationalgalerie in Berlin. The two buildings are covered by two thin flat roofs; the structure of the main pavilion roof is composed of I-beams supported by eight cruciform steel columns, encapsulated in a chromium-plated steel jacket, and by a number of rectangular steel columns concealed within the walls. That design, together with the white color of the roof slab painting, makes the roof look like it is “floating” without any support. A golden-onyx-clad wall is placed longitudinally in the middle of the main pavilion. 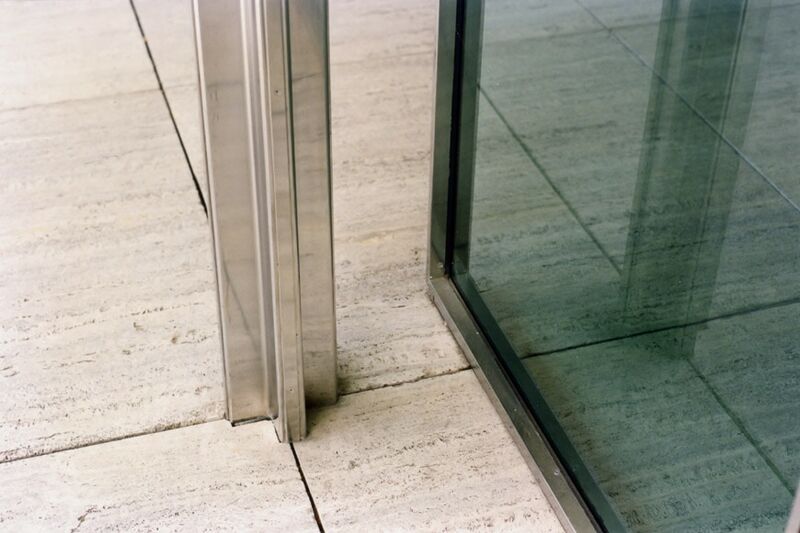 Indeed, Mies counterbalances the apparent simplicity of the building with luxurious materials which emphasize its geometry and aesthetics, thus following the example of Adolf Loos. 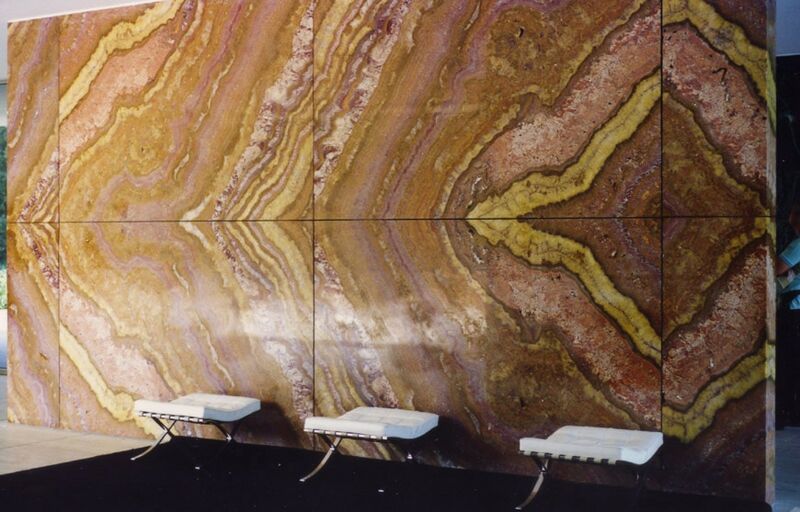 Together with onyx and Trevi travertine, the architect used two types of green marble, one quarried in the Aosta Valley Alps and the other in Tros, Greece. Also, the glass of the glazed panel has different colors and finishes, from clear white to smoked, from green bottle to the black mirror glass of the bottom of the internal pool. 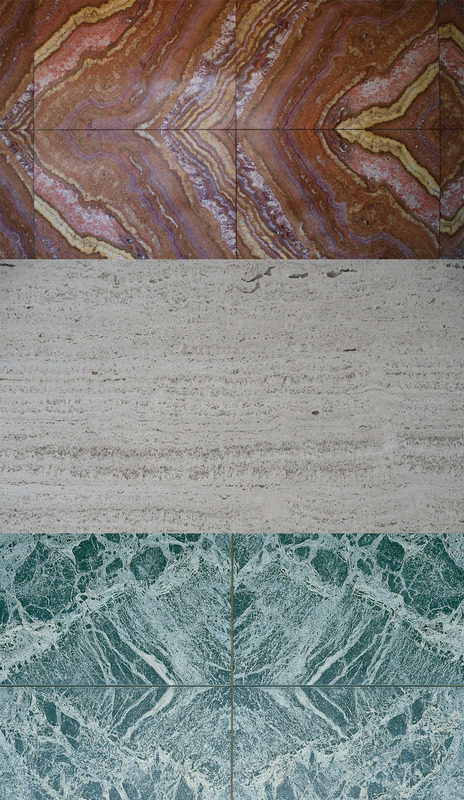 Three of the material used in the pavilion, from top to bottom: golden onyx, travertine, and green marble. 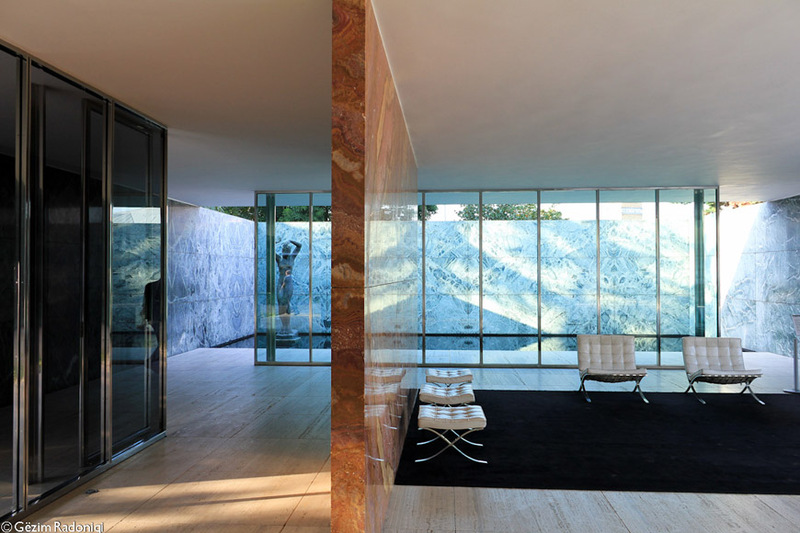 Mies intended the pavilion as a fluid, continuous space, lacking any sharp distinction between the inside and the outside; for that reason, he envisaged no doors to mark such separation, at first. 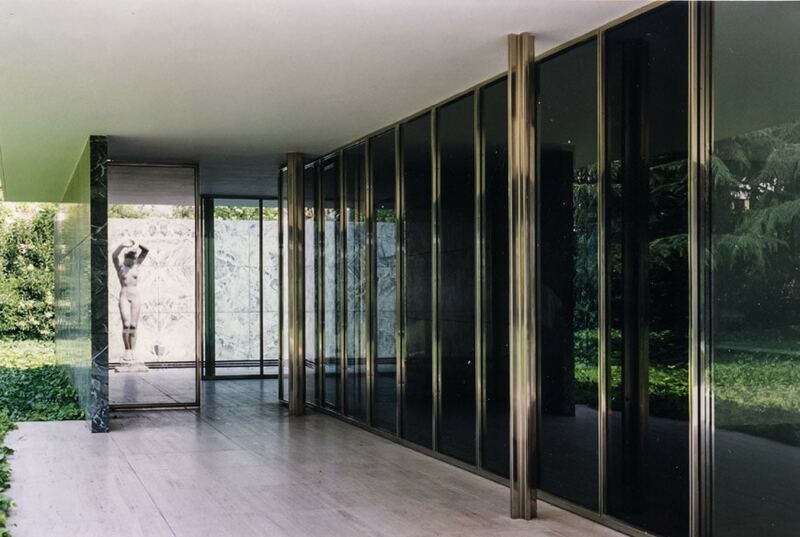 Eventually, two removable steel-and-glass doors were installed for functional and security reasons; yet, Mies wanted the pavilion to be photographed before that addition, which he didn’t like. Another fundamental element of the pavilion design was water, Mies designed two pools. 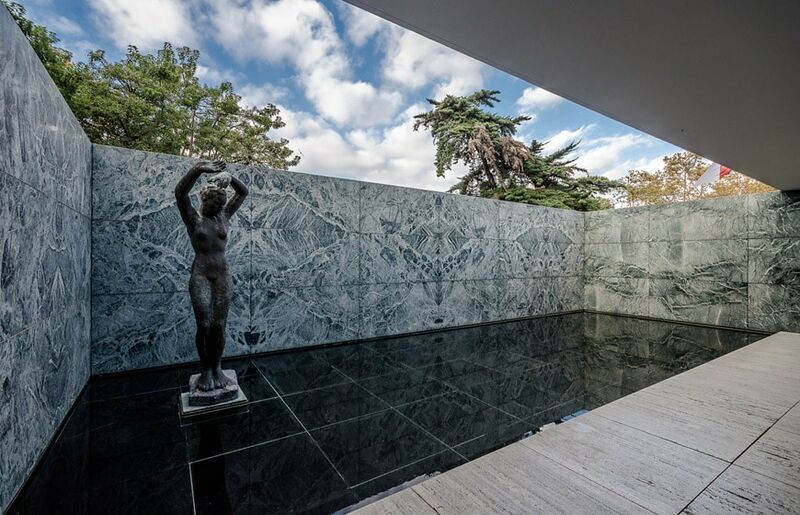 A larger one was placed near the building entrance with the aim to “mirror” the pavilion and further emphasize its visual lightness; a second pool, more “private”, is located at the east end of the complex together with “The Dancer” bronze sculpture by Georg Kolbe. 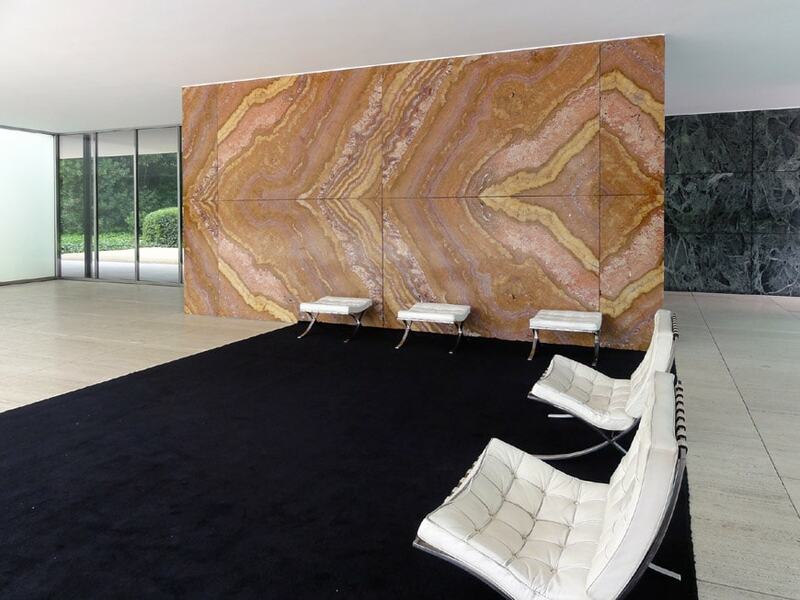 Along with the building, Mies van der Rohe and Lilly Reich also designed its furniture, including a stainless-steel and white leather chair, known as Barcelona Chair, which has later become a 20th-century icon and is still produced by Knoll, today. Conceived as a temporary pavilion from the beginning, the building was demolished at the end of the Expo, in January 1930, and the materials were sold to partially cover its construction costs. Over fifty years later, in 1983, Oriol Bohigas, who was leading the Urban Planning Office of the city of Barcelona at the time, started a project aimed to rebuild the pavilion from original drawings and historical black-and-white photographs. 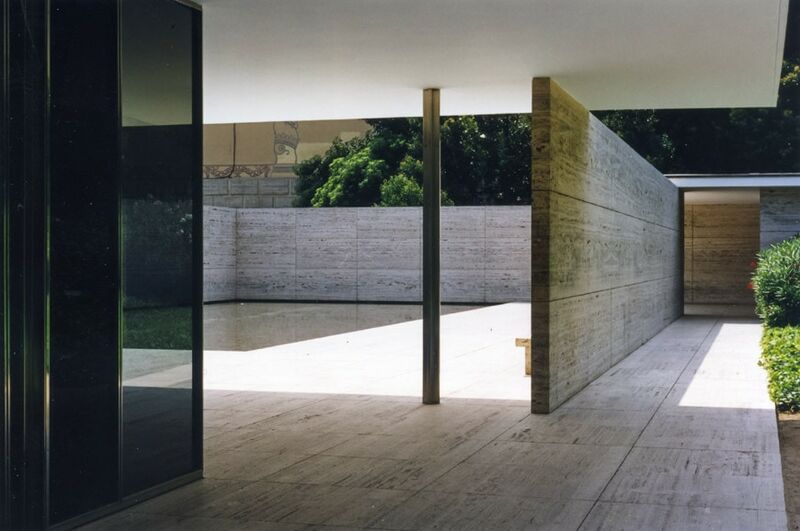 The project for the reconstruction of the pavilion “exactly as it was” was developed by architects Ignasi de Solà-Morales, Cristian Cirici, and Fernando Ramos. During a survey, the remains of the original concrete foundation of the pavilion were found, which made possible to discover its exact size. 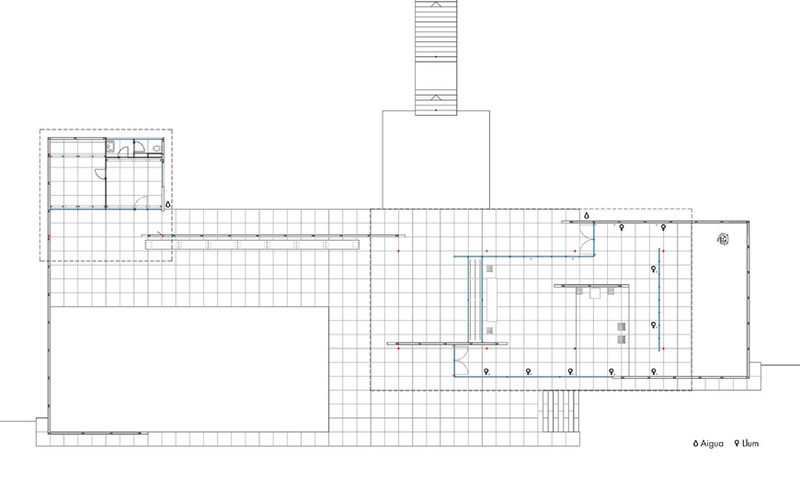 The design team was also able to get almost all stone materials from the same quarries of the original ones. Completed in 1986, the pavilion is now open to the public, and has been a venue for performances, special events, and site-specific installations by well-known artists and architects, including SANAA, Enric Miralles, Ai Weiwei, Xavier Veilhan, and Andrés Jaque. 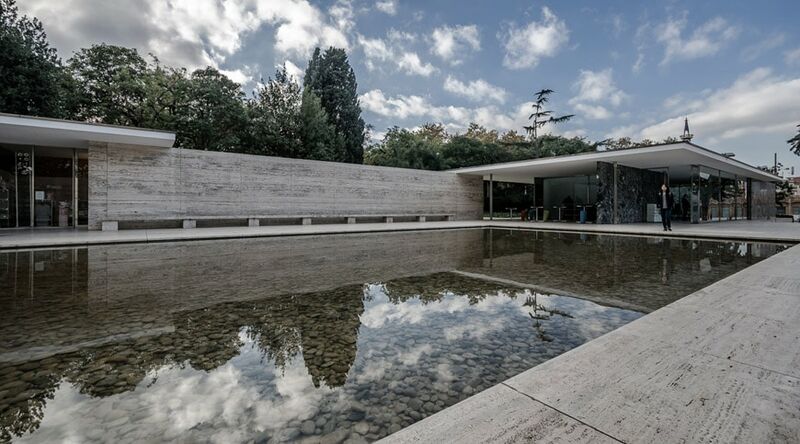 Since 1988, it also accommodates the award ceremony of the famous EU Mies Award biennial prize for European architecture. 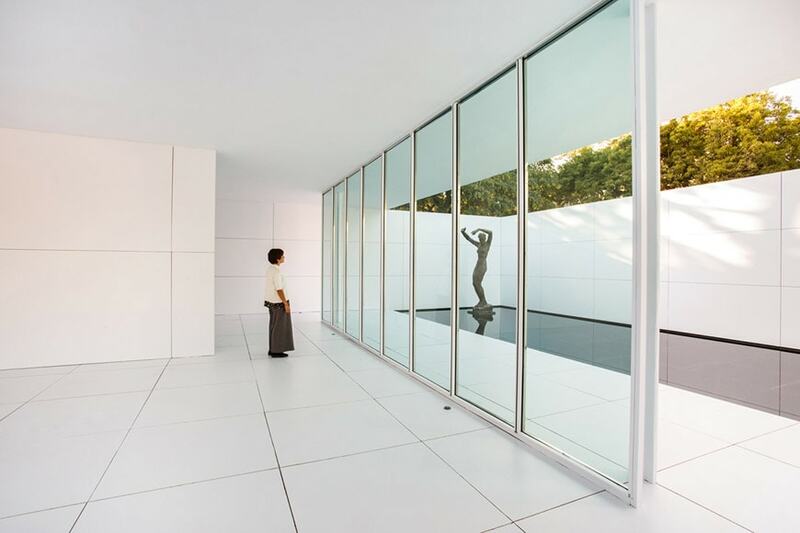 In 2017, the site-specific temporary work “Mies missing materiality” by Anna & Eugeni Bach tuned the pavilion into a total-white, dematerialized building; photo Anna Mas, courtesy of Fundació Mies van der Rohe Barcelona. Cover image © Pepo Segura, courtesy of Fundació Mies van der Rohe Barcelona.